Celebrate is a 55+ community in Fredericksburg, Virginia. Active adult homebuyers can find a variety of attached or single-family home designs that meet their tastes, styles, and budgets. This gated Del Webb neighborhood also provides the amenities, social clubs, and recreational activities that many active adults seek. Celebrate has a spacious clubhouse with plenty of indoor and outdoor amenities as well as over 60 clubs, classes, and committees that are sure to keep residents busy socially and mentally all year long. 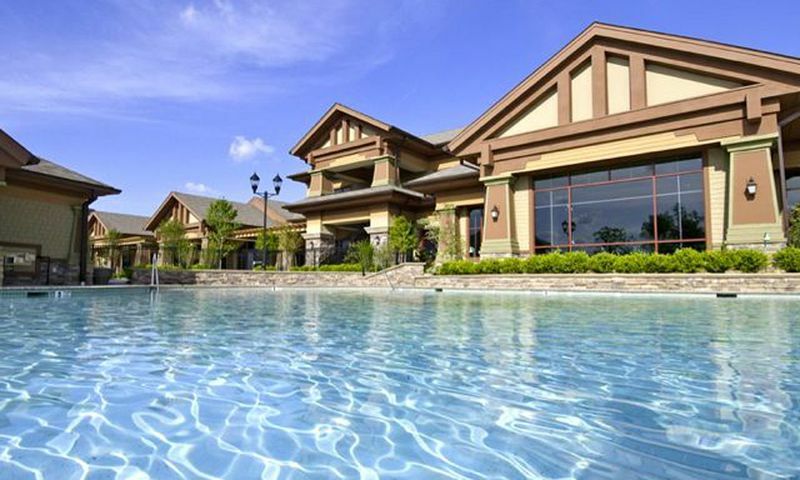 At the center of this vibrant age-restricted community is the 30,800 square-foot clubhouse called Riverside Lodge. Riverside Lodge provides all of the entertainment, physical activities, and social recreation that active adults want or need. Residents maintain a health regimen with the state-of-the-art fitness center, indoor pool, and indoor walking track. An aerobics and dance studio is also on hand for additional exercise classes or fitness groups. Afterwards, residents can soak their muscles in the indoor spa. Homeowners can socialize in the billiards or hobby and game room for a fun night. Outdoors, residents take dips in the swimming pool to cool off from a hot summer day or lounge on the patio with a good book. The outdoor dining terrace is the perfect place to enjoy a meal al fresco. Neighbors can challenge each other in a friendly match of tennis, pickleball, or bocce ball on one of the sports courts available. Golfers can practice their short game on the putting green. The outdoor amphitheater is ideal for enjoying an evening concert or entertainment. The community has gardening plots for the resident green thumb and is surrounded by plenty of parks and natural space as well as walking and biking trails that allow homeowners to get outside and spend time in this scenic environment. Construction of Celebrate began in 2008 by premier builder Del Webb. This 55+ community will consist of 1,100 residences upon completion. Del Webb offers a wide variety of innovative and distinct floor plans that come as attached or single-family designs within three collections called Villas, Classics, and Premiers. Active adult homebuyers can choose from the Villas collection, which are attached homes that range between 1,399 and 1,516 square feet of living space with optional basements. These new and resale homes have two or three bedrooms, two or three bathrooms, and an attached one or two-car garage. Villas feature large walk-in closets in master suites, extra storage space, low-maintenance exteriors, and energy-efficient designs. There are seven single-family floor plans in the Classics collection that range in size from 1,399 to 2,866 square feet. There are many options that include two to four bedrooms, two to four bathrooms, and an attached two-car garage. These are available as new or on a resale-only basis. These homes feature open layouts, gourmet kitchens, ample laundry rooms, walk-in closets, low-maintenance exteriors, and Whirlpool appliances. The Premiers collection features the largest homes inside of Celebrate. These single-family homes offer 1,664 to 3,338 square feet of living space. They have two to five bedrooms, two to four bathrooms, and an attached two-car garage. Homes within the Premiers collection feature covered front porches, ample storage space, open layouts, Whirlpool appliances, elegant master suites, and plenty of natural light in the main living area. Residents of this welcoming and friendly community enjoy a low-maintenance lifestyle. An established homeowners' association (HOA) takes care of tedious exterior home chores, which means active adults have more time to relax and pursue leisure activities. A reasonable monthly HOA fee includes lawn maintenance, irrigation, clubhouse activities, common area insurance, and common utilities. Homeowners can take advantage of all the events, classes, clubs, and recreational opportunities that are available to them in this fun neighborhood. Active adults can participate in groups like quilting, knitting and crocheting, photography, bridge, poker, or evening golf. They can also join the hiking club, wine club, book club, or history club to share similar interests with other neighbors. Celebrate also has a on-site lifestyle director who helps plan and organize activities, events, trips, and classes for members of the community to enjoy. With more than 60 clubs and special interest groups, residents will never have a dull moment in this stimulating environment. Located in Fredericksburg, VA, homeowners are never far from daily necessities, attractions, and entertainment. Fredericksburg is popular for its rich Civil War history and quaint downtown area. Residents have plenty of shopping and dining opportunities at Old Town Fredericksburg, Central Park, or Spotsylvania Town Center, which are all less than ten miles away. Medical facilities are close by as well and include Mary Washington Hospital, Stafford Hospital, Spotsylvania Hospital, and NextCare Urgent Care Clinic. Golfers and outdoor enthusiasts will love having these recreational areas nearby such as The Gauntlet Golf Club, Augustine Golf Club, Pratt Park, Lake Anna State Park, and Motts Run Reservoir. Cultural attractions and entertainment like Belmont Museum is five miles away and Riverside Music Dinner Theater is four miles away. Celebrate is the perfect 55+ community and retirement destination for active adults in Northern Virginia. Riverside Lodge - 30,800 Sq. Ft. There are plenty of activities available in Celebrate. Here is a sample of some of the clubs, activities and classes offered here. Active adult homebuyers can choose from the attached villas that have between 1,399 and 1,516 square feet of living space with optional basements. These new and resale homes have two or three bedrooms, two or three bathrooms, and an attached one or two-car garage. Villas feature large walk-in closets in master suites, extra storage space, low-maintenance exteriors, and energy-efficient designs. We have lived here almost two years, after buying our home new from Pulte Builders. Del Webb may be good with developing Active Adult communities, but Pulte Builders is absolutely terrible to work with. They are dishonest in making you believe one thing and delivering a miserable experience. I would avoid Pulte Builders in all situations! Celebrate Virginia has not delivered the amenities originally planned, and the clubhouse is much to small to support over 1000 homes. Homes are not built with quality construction but they do look nice on first sight. The club house is nice but it will not be big enough to handle the residents when community is done being built already when shows are held in clubhouse it cannot handle the crowd. The landscaping is very poor and Del Web will do nothing about dead spots in lawns dying trees in neighborhood and drainage areas. The people in the community are very nice and everyone seems to get along well. If you are buying a home in this community please know that the quality of work that goes into building the homes is very poor. Hopefully you will not have the issues we have had with our house, most of which have been rectified, but some they refuse to fix. Just know coming in when you buy you will more than likely have issues, not unlike most home builders, but you will see poor overall quality. As far as the community goes, it is very quiet, clean, and the club house is very nice. Hopefully they will resurface the roads in the villas because they are very rough with drainage lids protruding from the road several inches. Verdict is still out for us on this community and home but wish all potential buyers good luck. Great active adult neighborhood. Clubhouse is large and active. Newer homes with lots of great features! We love our home in Del Webb!! We have been here for 6 months and everyone is friendly and we love all of the amenities it has to offer. Research before you buy here. 10 year warranty is misleading. Poor quality materials used. Have had more issues in this home in three years than we had in our home we lived in 22 years. Community is not in th best location. Shopping is inconvenient. If you like Target and Walmart then you would not have a problem. We have now been here 2 years and LOVE it! There is always something to do and lots of new people to meet. The Lodge is great and everyone is so friendly. You have no reason to be bored once retired! It's exciting to see new homes being built. We've been looking at homes here and over at Falls Run. They are both very nice communities so it's hard to choose. We like that the homes are newer here and we could still buy a new home. The amenity package is similar at both but the clubhouse is newer here and they have an indoor walking track and a putting green too. But, Falls Run is complete so no more construction to deal with so that is a minor concern. Wow this is a hard decision! 55places.com is not affiliated with the developer(s) or homeowners association of Celebrate. The information you submit is distributed to a 55places.com Partner Agent, who is a licensed real estate agent. The information regarding Celebrate has not been verified or approved by the developer or homeowners association. Please verify all information prior to purchasing. 55places.com is not responsible for any errors regarding the information displayed on this website.